Soup Choices - Mushroom and Brie - Crab and Corn Chowder - Curried Carrot - French Onion - Minestrone - Italian Wedding Salad Choices: - Classic House Salad - Mixed Green Salad - Caesar Salad - Cranberry Pecan Salad - Belgian Endive Salad - Heart of Bibb and Radicchio - Tomato Mozzarella Salad - Fresh Seasonal Greens Entree Choices: - Whole Grain Penne - Grilled Airline Chicken Breast - Chicken and Andouille Sausage over Linguini - Pan Seared Grouper - Herb Crusted Pork Tenderloin - Lightly Blackened Gulf Shrimp - Pan Seared Skin-On Snapper - Roasted Garlic Rubbed Prime Rib - Grilled Beef Tenderloin - Grilled Lamb Lollipops - Crab Stuffed Grouper Rockefeller - Red Wine Braised Short Rib - Grilled Filet Mignon with Seared Lump Crab Cake Please see attached PDF for more menu options. Bronze Package: - Choice of one Tier 1 hors d’oeuvre and one Tier 2 hors d’oeuvre - Fruit and Cheese Display - Choose One: Maple Brined Double Breast of Turkey OR Honey Glazed Ham *Upgrade to options in the silver or gold packages for additional cost - Choose One Station: Pasta Station, Shrimp and Grits Bar, Potato Bar, S'Mores Station, Salad Bar, Grilled Cheeses Station - Non Alcoholic Beverage Station (Includes Sweet and Unsweetened Tea, Water, Coffee, and Soft Drinks) Silver Package: - Choice of one Tier 1 hors d’eouvre and one Tier 2 hors d’oeuvre - Fruit and Cheese Display or Farmer's Market Display - Choose One: Herbed Crusted Pork Loin, Prime Rib, Smoked and Cured New York Strip Loin with 5 Onion Ajus, Maple Brined Double Breast of Turkey, Honey Glazed Ham - Choose Two Stations: Pasta Station, Shrimp and Grits Bar, Potato Bar, S'Mores Station, Salad Bar, Grilled Cheeses Station - Non-Alcoholic Beverage Station (Includes Sweet and Unsweetened Tea, Water, Coffee, and Soft Drinks) Gold Package: - Choice of one Tier 1 hors d’eouvre and one Tier 2 hors d’oeuvre - Fruit and Cheese Display or Farmer's Market Display - Choose Two: Slow Roasted Prime Rib of Beef, Lump Crab and Spinach Stuffed Tenderloin of Beef, Herbed Crusted Pork Loin, Smoked and Cured New York Strip Loin with 5 Onion Ajus, Maple Brined Double Breast of Turkey Honey Glazed Ham - Choose Three Stations: Pasta Station, Shrimp and Grits Bar, Potato Bar, S'Mores Station, Salad Bar, Grilled Cheeses Station - Non-Alcoholic Beverage Station (Includes Sweet and Unsweetened Tea, Water, Coffee, and Soft Drinks) Please see attached PDF for more menu options. The Peninsula Golf and Racquet Club is located in Gulf Shores just off of Fort Morgan Road. 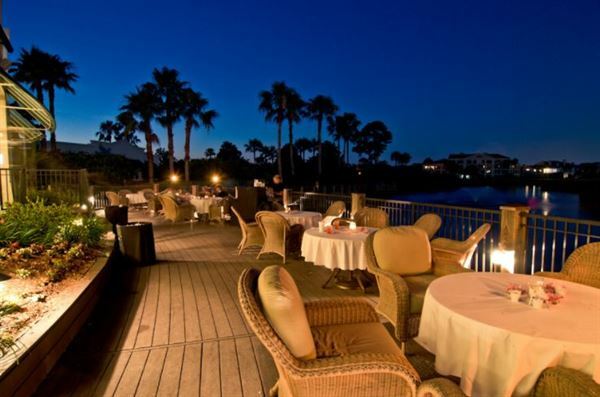 The Peninsula is the perfect setting for all types of events. We have used the private reception rooms two separate times and have been well satisfied with all Peninsula and their staff offered.